These die-cast trucks are loaded with one pallet of "what could have been," two pallets of "late inning breakdowns" and three pallets of "bitter cold memories." That was then, however. This is now. All this heavy cargo can swiftly be discarded because the 2004 Boston Red Sox are the new World Champions of Major League Baseball. Curse? What Curse? 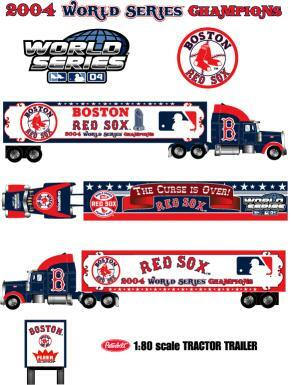 Fleer is celebrating this historic event by releasing the official commemorative Boston Red Sox 2004 MLB World Series Championship tractor-trailer. This 1:80 scale collectible prominently features the Boston Red Sox Championship logos, MLB World Championship trophy, and the colors and logos of the World Series and Major League Baseball. The top of the tractor-trailer truly culminates the uniqueness of the item with a banner that reads, "The Curse is Over." Along with the banner are the 1918 Red Sox World Series logo and the 2004 World Series logo. "This moment is exciting for Major League Baseball and baseball fans as a whole, and we are thrilled to be associated with the celebration." said Fleer spokesman Joshua Perlman. "We hope this commemorative die-cast item will pay tribute to the great Red Sox champions of today, along with those great Red Sox teams of yesterday." Fans of baseball, both young and old, will not want to miss out on this one of a kind die-cast collectible. These limited edition tractor-trailers will be available just in time for the holidays in December. Pick one up and load it with new memories such as clutch pitching, late game heroics, and even some "idiots!" Time to hit the road and join the convoy of fans eager to celebrate the Red Sox victory! For more information and other licensed die-cast items, please visit us at www.Fleercollectibles.com.